As part of our new Spotlight: Women & Non-Binary Artists, we’ve partnered with SoundGirls to share a weekly profile on the “mighty but marginalized” members of the arts and music community. This week, we’re featuring Mary Shipman Howard. She not only worked with great musicians and composers of the 40s, such as Glenn Miller, Arturo Toscanini, Charles Ives, and Samuel Barber, but was one of the earliest known female recording engineers and studio owners. Mary was born in 1911 in Hartford, Connecticut to an affluent family who supported the local arts. She played viola but got arthritis at an early age. In an interview with Vivian Perlis (part of the OHAM Charles Ives collection), Mary said, “Since I always loved acoustical, mechanical things – the process of translating a sound wave into an electrical impulse and back into sound – I got really into recording.” Mary was intrigued by records, and she bought a recording machine and started learning about record cutting on her own. She came to New York in 1940 and applied for an engineering job at NBC. At the time, women weren’t allowed in the union, so Mary was hired as a secretary. When NBC became short on staff during World Word II, the union decided to let women engineer. Mary was the only woman at the NBC studios for around six months, but it didn’t take her long to make a name as a master recording engineer. Her first assignment was Glenn Miller, whose music she liked even though she had a classical music background. She was assigned to recording sessions for Toscanini at RCA. There was a union deal between NBC and RCA which required an NBC studio engineer to be at RCA Victor. Mary couldn’t work, but the RCA Victor engineer couldn’t work without her there. Mary said (in her Perlis interview) she “didn’t do anything except sit with my eyes falling out of my head, and my ears dropping off.” Mary worked with Toscanini for eight years. While Mary was at NBC (around 1945-46), she started a small studio in the same building she lived in called “Mary Howard Recordings.” It was three blocks from NBC (37 East 49th Street), and she worked at the studio part-time. She left NBC after the war (because of the long hours). But, by then, she found her studio was in high demand. She told Perlis, “I had all the best Ampex equipment, and I was the first private person ever to own a Scully lathe. Nobody else could afford it. I couldn’t afford it, either, but I got a loan from the bank. It was wonderful fun while it lasted, and the most fun were the people who suddenly, by word of mouth only, came to have me make recordings for them.” Time Magazine even did an article about Mary and her studio in 1947. One of Mary’s clients was composer Charles Ives who asked her to do all his recordings of rehearsals and broadcasts. Ives would get letters from people asking how to interpret his music, and he would send them a recording instead of explaining it on the phone (part of Mary’s job was labeling and sometimes mailing). Mary had other clients who recorded for personal use or came to the studio for late-night listening sessions (like William Schumann and Alan Hovhaness). In 1947, Mary started releasing her own commercial recordings under the MHR label. Artists included The Herman Chittison Trio, Ethel Waters, Lucille Turner, and Dale Belmont. “Mary was very unique. She was a musician who understood musicians and understood a good deal about recording and how to marry the two – both the personalities of the musicians and the temperament of recording equipment. 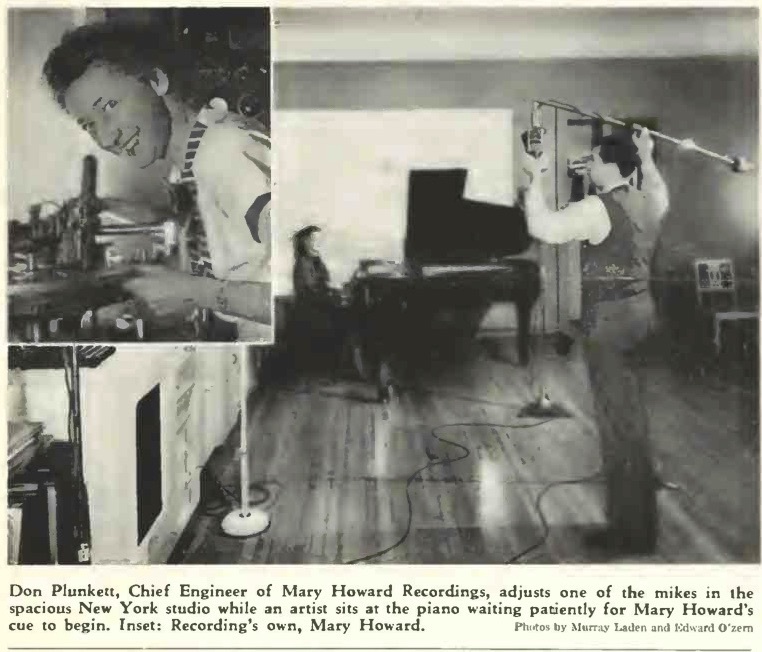 Mary was featured in Audio Record Magazine in 1948. At the time, some of the studio’s recording equipment included Van Eps lathe, Allied Cutting lathe, Presto 1-D Heads, and Langevin 101-A Amplifiers (the preamps and program amps were Langevin). “We are of the opinion that a compact, consolidated recording and control room, combined adjacent to and visible to the studio is the best method of recording. With this setup a recording technician can actually ‘ride gain’ but what is more important can see what actual level is imposed on the disc. We feel that the term ‘riding gain’ is a poor description of the operation involved. The more dynamics achieved in a fidelity recording, even if the frequency response is limited, the more the sound originating in the studio will be approximated. We feel that too much emphasis can be put on the word ‘fidelity’ and that some of the pre-emphasized and over emphasized high frequencies often result in a sound unpleasing to the ear, which after all is the final judge. Mary closed the studio in 1955 when she grew tired of being in the city. She tried to split time in and out of New York, but it eventually seemed silly. She wanted to spend time outdoors, garden, and “try to make weekends meet.” (Perlis interview) She married Edwin Pickhardt (date unknown) and changed her name to Mary Howard Pickhardt. After her recording career, Mary became a breeder of pugs under the name Sabbaday Kennels (named after the street her home was on in Connecticut). Her pug, Ch. Sabbaday Echo, won best of breed in 1963. Mary was recognized by her colleagues for her commitment to the breed (including helping give the national pug exposure). She was active with the Pug Dog Club of America and Mary (and her husband) were respected judges at dog shows across the US. Sylvia Sidney, a stage and screen actor who owned and showed pugs said in the New York Times, “Mary was probably the best breeder and exhibitor of pugs on the Eastern seaboard.” Sylvia mentioned one of Mary’s dogs was on the cover of the American Kennel Gazette (likely the December 1963 issue; the pug on the cover was not identified). Mary died in 1976 (at age 65). She had a son, Arthur Shipman Howard, and four grandchildren.